Amateur astronomers from Australia and the Philippines have detected an apparent “impact” on Jupiter. The event was captured at 20:31 UT on June 3rd. Both Anthony Wesley (Australia) and Christopher Go (Philippines) obtained video showing a short lived (~2 seconds) flash that appear very similar to impact-related flashes seen on Earth’s Moon. The video frame below is from Wesley’s video, while a movie by Go can be found here. Video image of the June 3rd impact "flash" on Jupiter. Credit: Anthony Wesley. This is the 3rd impact event observed on Jupiter. The previous two, the Comet Shoemaker-Levy 9 impacts in 1994 and the July 19, 2009, were observed after the fact as dark spots due to expanding debris falling back unto the cloud deck of Jupiter. This is the first time ground-based observers have imaged the actual impact of a body into Jupiter. Events of this size may happen quite often. As more and more amateurs monitor the planets, we should expect additional examples to be captured. 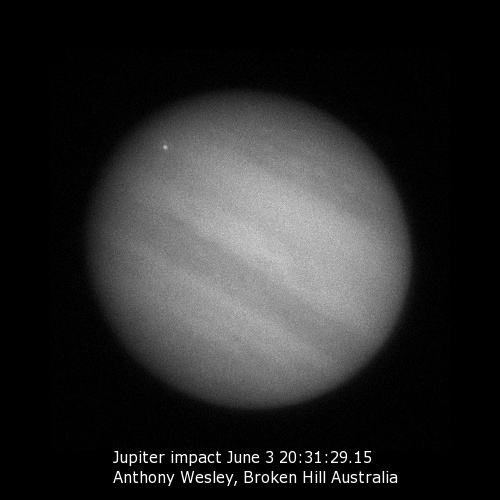 In fact, this is Wesley’s second Jupiter impact as he was the first person to notice the July 2009 impact. Pervious posts on the 2009 impact can be found here, here, here and here.